working with the garden team planting a wide variety of rare and heirloom varietals including purple Sicily cauliflower, salsify and NZ warrigal greens. We recently dined at Sault to celebrate our birthday (both mine and Lost magazines) and this was one of our favourite dishes. Hugh and the team have kindly shared the recipe with us for you to recreate at home. In a medium-hot pan sear scallops on one side and turn over add butter and glaze till cooked through. Mix starch, oil, squid ink in a blender, mix until combined, add water continuously until all combined and continue to blend for one minute, spread in between layers of cling film and roll to approx. 2 ml thick. Steam for ten minutes at 100˚C let cool and set. Then take cling film off and dehydrate for 12 hours at 45˚C. Deep fry at 180˚C until puffed and salt to taste. 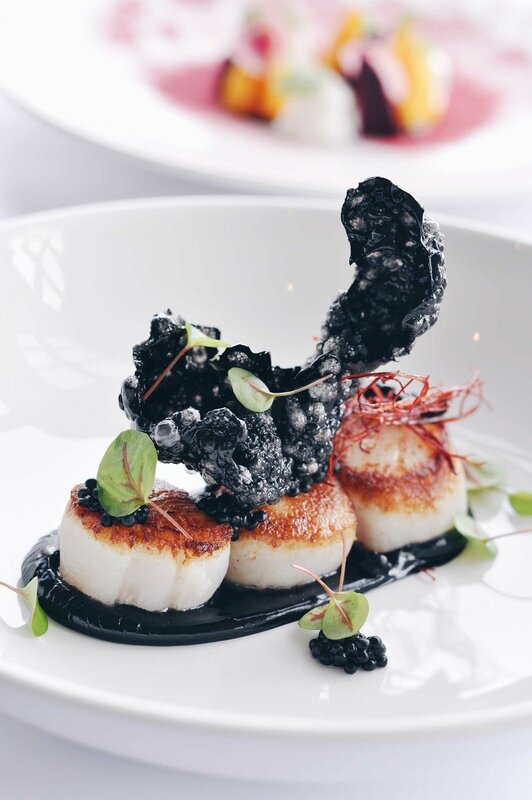 Swipe squid ink mayo on a plate, arrange scallops and garnish with caviar, candied chilli, tapioca crisp, leaves or edible flower of choice.